Chocolate chips are small chunks of chocolate that can range in size and are most often shaped as a flat-bottomed teardrop. Chocolate chips are often used in baking and are a required ingredient of chocolate chip cookies, invented in 1933 by Ruth Graves Wakefield of the Toll House Inn near Whitman, Massachusetts. 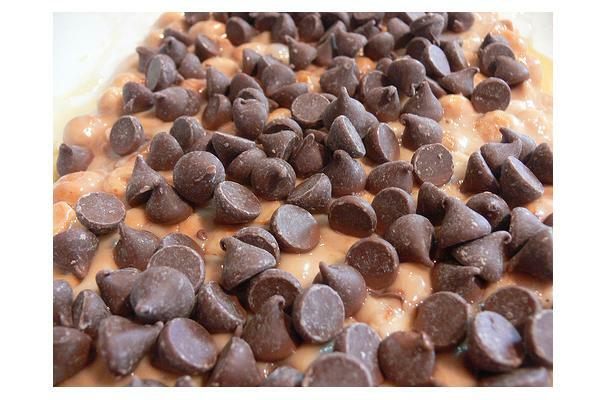 Chocolate chips were originally made of semi-sweet chocolate. Today, chips come in a variety of flavors including: cinnamon, butterscotch, peanut butter, white chocolate, and a variety of dark and milk chocolate flavors. However, chocolate chips are not always recommended as a substitute for melted chocolate because most chips are designed to retain their shape while baking and contain less cocoa butter than baking chocolate. Chocolate chips come in various sizes but are typically half the size of a jelly bean. The texture is smooth. There are also different qualities of chocolate chips ranging from premium to low grade chocolate. Colors: Depending on chocolate selection, chocolate chips are white or light to dark brown. Flavors: Depending on selection of type of chocolate, flavors can be bitter, semi-sweet, or sweet. Mouthfeel: Hard, Rich and creamy when melted in mouth. Choosing: Choose bags that have not expired. Buying: Chocolate chips can be bought at grocery store and at any large retailer like Walmart or Target. Typical dishes include cookies, pies, hot chocolate, melted for dipping purposes, fruit, granola bars, and pastries. Cleaning: No need to clean chocolate chips before use. Store chocolate chips at room temperature or in the refrigerator. Not necessary to refrigerate chocolate chips, even after opening. History: Chocolate chips were first used by Ruth Wakefield at the Toll House Inn in 1933. Cool site! I added your widget to my blog. Thanks!